Once upon a time, a lifetime ago, I began my writing career when my contemporary romance, Romanian Romance, was published in 2005. Then I dabbled in historical romance, finaled in a book contest, and changed my allegiance. 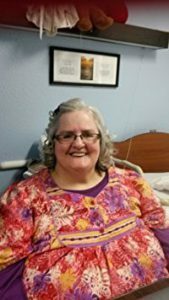 In July of this year I celebrated the release of my fiftieth book. Between then and now I’ve dabbled in contemporary, several of them this year. Of the seven novellas to be published this year, three of them are contemporary. Cinderella’s Boot grew out of something I saw while driving down the street in Oklahoma City. A single cowboy boot lay on the side of the street. Who did it belong to? How did it get there? A dozen ideas jumped to mind. When my editor at Forget Me Not Romances invited me to write a story about runaway brides, I knew I had my chance! A modern-day Cinderella left her wedding boot behind at the altar. . .
writing my story, Her Rocky Mountain Highness. A Colorado tourism director welcomes a deposed prince of a European city-state “in the summer of his twenty-seventh year.” I’m having a ball with it. I had fun writing two retold fairy tales this year, so looked for a third story to complete a set. The perfect opportunity is coming up in next spring’s On Kitten Paws, reworking Puss ‘n Boots. A rich man leaves the bulk of his inheritance to his two older sons. He leaves his youngest son a run down fishing boat, its gear, and a pair of fishing boots—complete with a cat in residence. Yesterday, today, and forever, love will abide. Four years later, she’s back home—and so is her ex-fiancé, now a DVM from Oklahoma State University. They reach a truce and work side by side in his father’s animal clinic. Cyn soon discovers she wants more—but she has to battle bad history and a demanding pet owner for Keith’s attention. 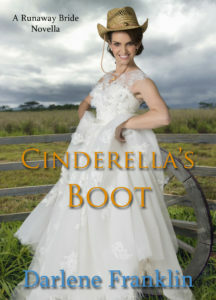 Darlene would like to give away an e-book of Cinderella’s Boot. To enter, leave a comment answering the following: What are some interesting things you have seen while driving/riding? We recently took a long road trip and saw a stretch of intrastate highway with a busted and ripped up tire every couple of minutes….and the stretch of tires went on for quite some time that all four of my kids in the car and my husband who was driving noticed it, too. Ooh, definitely. I’d love to read it. Mystery of course was another alternative for the single boot. Hi Elizabeth and Darlene. Most bizarre things: an infant bouncer seat by the side of the freeway-?? There was a stretch of road, a few kilometres long, near where I went to Uni, that had car hubcaps placed along it- we could never work out why! Oh, my, especially if it was empty! Let me rephrase. I can possibly imagine that with a family on an outing. But not abandoned on a freeway. Hi, mostly things on the road I see are roadkill so I try not to look, but one day a gorgeous bald eagle was eating said roadkill and it flew as I approached, was the closest I had ever been to one and it was breathtaking. That must have been beautiful. Hi Darlene and Elizabeth. Being retired, my husband and I take back road trips through western Michigan and northern Indiana and see lots of roadkill. Last fall roadkill was whole families of raccoons. By winter we wondered if there were any raccoons left in Michigan. This spring it was opossum. Probably because the raccoons were gone. What was sad was a Facebook post, stating that some drivers deliberately were killing raccoons. Then there are deer, the occasional cat and dog, and birds. We have seen tennis shoes, baseball caps, t-shirts and once an old mattress. The most unusual thing my 12 year old grandson saw, was a cell phone. The family was on the way to church and he spotted a cell phone on the side of the car. My son stopped and they picked it up expecting it to be broken, but it was in tacked. The phone had a passcode, but they called the emergency contact – the man’s father. The man was so happy to get his phone back, that he gave my grandson $50 cash and my son a gift card. The man had put his cell phone on top of his car and forget when he left to run errands. Love hearing about author’s writing journeys. Best wishes! Happy writing. I love that story! That’s how things should work. Amy, I’m looking forward to writing it. When I get an idea for a story, it starts to ferment, and I’m eager to start. Only it’s 2-3 books down the road. That’s okay, though. I deliberately think ahead so that when I begin to write, it flows more smoothly. John Denver is one of my all time favorites. I got to see him in concert also. One of the best shows I’ve ever seen. Midway through he sent his band off stage for a break but he stayed and played and sang some more. Your book sounds interesting using his song Country Roads. I’ll have to be looking for it. Yeah! Another John Denver fan! My individual story is based on Rocky Mountain High. Recently my husband was at the gas station. When he looked at the next pump, there was a gentleman on a motorcycle wearing a life jacket! Now, that demands a story! Lots of armadillos but we are in mid Missouri ( saw one in St. Louis near the inner belt) they are moving north! We also saw the same eagle on a roadkill going to our hunting land and coming back. Most scary was on Highway 270 around St. Louis: my friend and I were out shopping and took the highway for a shortcut. All of a sudden in the middle Lane of the busy highway was a truck bumper! I did manage to get around it without mishap! Thanks for the background information. I love to hear what inspires writers! Crunching tarantulas under your tires. Sounds like the beginning of a horror movie! I’m thinking about riding a service dog story and I can just see a service dog riding beside his human partner on a motorcycle. Thanks for the image! Paula, I remember seeing an armadillo a few times, but not a lot. Inspiration comes from everywhere. I’m constantly bombarded with ideas. I tuck them away and eventually pull out several strings to put together a story. Some, sigh, will never be written. Writing from a nursing home… that’s a great story right there. I’m intrigued. In my 20’s I worked in one for 6 years and often miss it still, 22 years later. I’ve seen lots of interesting things on the road, as we used to take 4 week road trips with our (then) 3 children every summer. Once we drove along Route 66 somewhere at night on a deserted road and heard constant crunching under the tires. We investigated and found thousands of tarantulas running around the road. Gross! Last week I saw on a man on a motorcycle and he had rigged on the back a small platform with sides for his dog. It looked dangerous to me but it was fascinating. Of course at the traffic light I HAD to take a picture! This sounds like a great book! I can’t recall seeing anything super unusual on the side of the road. I remember one spring, while driving on a long road trip, there were hawks sitting every three or four fence posts apart, for miles! They were all migrating north but it was interesting that they left “space” between themselves. I did remember recently seeing a small clip on our TV news channel. We had so much rain that the trenches in front of our church filled up with water and made a small canal. A man was in a small boat rowing away! Oh, I can see that used in so many ways, It reminds me of the boats used after Katrina. 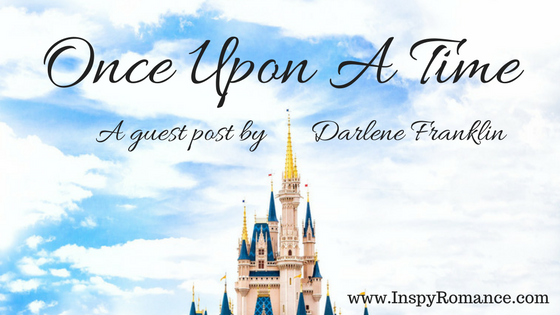 Welcome to Inspy Romance, Darlene! I love the premises of your fairy tales. They sound fun! My husband picks things up beside the road. Once he found a 5 gallon Rubbermaid water cooler we still use on every camping trip. This summer he found a funnel that is just the right shape for pouring diesel conditioner into our truck’s tank! We’ve been along a stretch of highway where there’s a necktie looped around every fencepost, and another with baseball caps nailed to the tops of posts. Both of these go on for miles! Neckties and baseball caps? Have you written a story about them?! We lived in Cambodia for 3 years, and learned to always have a camera along. I have a whole Shutterfly book of “Things you can carry on a motorcycle,” including a bathtub, a double bed mattress, and a heavy metal security door! That sounds like a whole series. . .
I’ve seen the usual things while driving, people putting on makeup, eating in the car, texting, reading a book, looking at paperwork or a map but my husband who used to be a long distance truck driver has seen it all. I won’t go into detail because some of it is not fit to put into print. I bet he has some tales to tell. I can’t think of anything I’ve seen recently but it always looks funny to me when I see two halves of a house going down the road on separate trucks. I haven’t seen that often, but that is quite a sight. Susanne, I’m trying to reply to you, hope you see it. A boat on wheels, it must be. That would be a sight. Until about 8 yrs. ago, hub and I rode motorcycles (I was passenger), and it was funny to see the looks on faces as people recognized who we were!! Now I prefer to read…lol….and have read a book or two by you, Darlene! Jackie, glad to hear it. I haven’t really seen too many oddball things while driving down the road. Living in Oregon and traveling up to Washington often, we see log trucks, wood chip trucks, many various RV’s, 5th Wheels, travel trailers, horse/animal trailers and etc. I think of all the things we really like to discover is license plates from other States. Even those from BC! Yes, I’ve even had inspiration from word search puzzles, lol. LOL, Darlene! Now I have the song stuck in my head! That’s what we’re hoping for! I find animals when I’m riding in a car. My husband says I have a keen critter eye and can spot an animal three miles ahead on the left!